Four days prior to February 22, I was hospitalized and then luckily discharged in time for this book signing event. My good friend Neema and I originally planned to come to Glorietta at 4AM but dismissed the thought altogether: we were doubtful that maybe not too many people will show up and we might both get headaches due to lack of sleep. 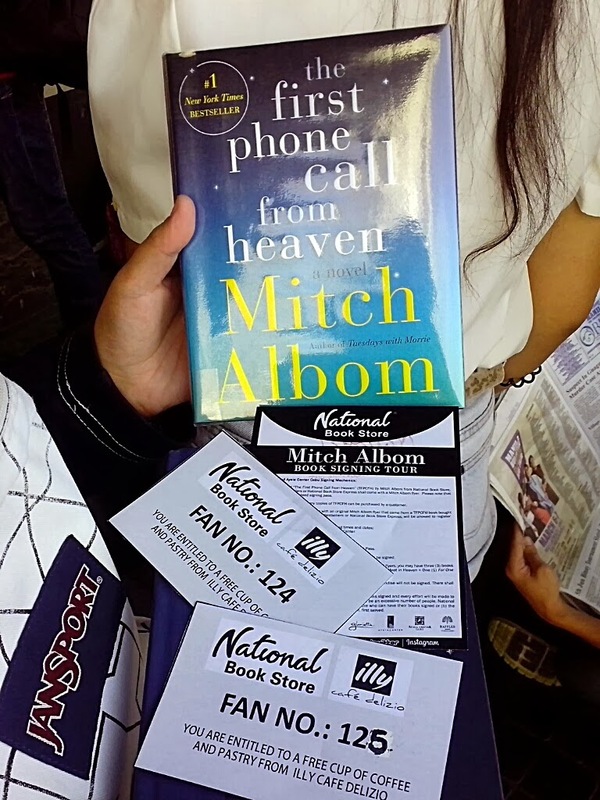 We then left Cavite at 6AM and reached Glorietta National Book Store (NBS) at past 8AM. To our surprise, there were a lot of people already! The line was twice the length of NBS and J.CO Donuts and it’s almost two hours yet from start of registration. One guy was giving out free coffee and pastries from ILLY COFFEE for the first 200 people and we were fan number 124 and 125. I wonder what time those first comers came; maybe they stayed the night prior. Such fanfare. and so my book officially got number 203. 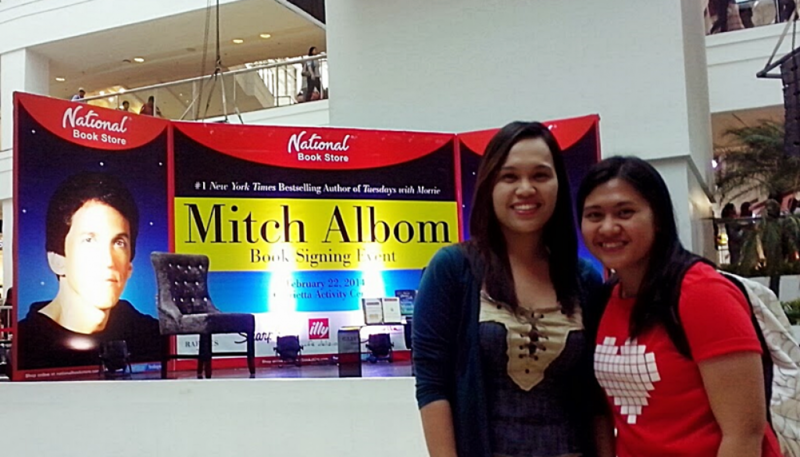 It is my first time to attend a book signing and I never knew that it could be this time-consuming. It is really best if one will come with company, because I could just imagine the immense boredom if one comes alone. On the other hand, it could also be a venue for meeting new friends, if you are the chatty type. In this generation more used to clicking on pages rather than turning them, I’m so glad there are still kids who read. The man of the hour came out a little late as he emerged at 2:10PM (book signing must be at 2PM, but of course, he is very much forgiven), he was at the mall’s 3rd floor, sporting a simple blue shirt and waving a digital camera to us his fans. The crowd went crazy with his every move. I can tell he was overwhelmed with the number of people at the event as the first thing he said when he went up the stage was, “Wow”. 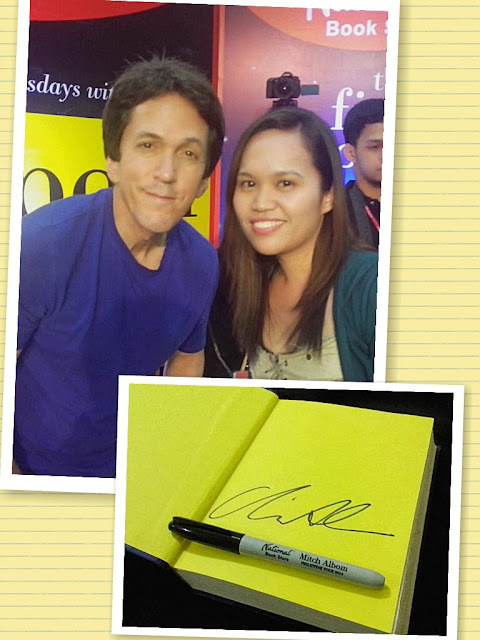 A short interview proceeded and although I have read most of his books, I realized I don’t know anything about this man, Mitch Albom. Now I know that he started as a musician, then sports writer, then your biggest selling author of all time. He speaks eloquently, with so much passion and compassion. He tells jokes in that interview and he even sang for the crowd! 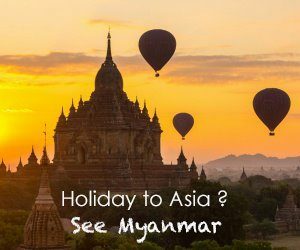 Mitch Albom has been asked countless of times to visit the Philippines and countless of times also, he rejected the offers. If not for what had happened to Tacloban, he would not have decided to visit the country. On Monday, February 24, he will go to Tacloban to donate 40 fishing boats painted with titles of his books and 10 libraries to that devastated area. He also tapped some of his writer friends like John Grisham, Amy Tan, Stephen King, etc., to donate books of their own to Tacloban. But he promised, that if his latest novel will became a hit as a movie, he will return to the country. When asked what he thinks is the greatest lesson one could get from all his books, he still gave the credit to his late teacher Morrie: To him, GIVING IS LIVING. “You can take and take. You can get a nice car. You can get fancy clothes, you can get a bigger house; but very quickly those things wear off, they disappear. But if you give something to someone, if you affect a life, if you help a child, if you help a relative who needs help or a friend, or you just take somebody out of trouble; that feeling, you feel bigger almost, you feel a sense of purpose. You feel like that’s what we are actually here for. At past 4PM, I got my most coveted autographed book. I was able to shake his hand and he asked how I was doing. I was so elated I did not notice that a souvenir marker was being shoved to me, haha. Cool, so many freebies! I believe there were roughly 2,000 people there, I wonder if he has finished signing all the books within the mall hours. After all, it is here that he has the biggest fan base outside of America. I went home truly inspired. There are so many lessons in his words that he must be really born to inspire people and thank God he is doing what he is doing right now. He is so big now, yet he is very humble, I guess someone just earned a spot in the prestigious list of people of my 2014! THE PEOPLE OF MY 2013	PhilHealth Blues: Whose job is it to have CF2 accomplished?